This is the Wikipedia version, of Lord Elgins acquisition of the Classical Greek sculptures and art objects from the Parthenon during the early 18th Century. 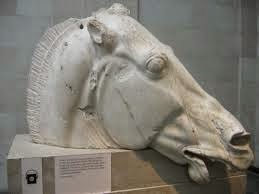 But, although there are many reasons why the Elgin Marbles should be returned intact to modern day Greece, there are just as many why they should not! ‘From 1801 to 1812, Elgin's agents removed about half of the surviving sculptures of the Parthenon, as well as architectural members and sculpture from the Propylaea and Erexhtheum. The Marbles were transported by sea to Britain. In Britain, the acquisition of the collection was supported by some, while some critics compared the Elgin's actions to vandalism or looting. Following a public debate in Parliament and the subsequent exoneration of Elgin, the marbles were purchased by the British government in 1816 and placed on display in the British Museum, where they stand now on view in the purpose-built Duveen Gallery. Thomas Bruce – the 7th Earl of Elgin - obtained a controversial permission from the Ottoman house to remove pieces from the Parthenon while serving as the British ambassador to the Otterman Empire from 1799 to 1803.’ Wikapedia. Looking at it in simple terms, it is clear that Lord Elgin purchased these valuable marbles from the Turks for an undisclosed sum of money, backed up by all the necessary documentation and permissions and proper authority of the day. He saw no reason for any future discourse and believed that by removing them from Athens, he was doing the whole world a big favor by keeping them secure and intact in an internationally respected museum where they could be admired by anyone. That's it in a nutshell. If he had purchased an Arab Stallion or a ship, the whole matter would by now have been forgotten. The Ottomans were the authority at the time - and had been so for some four hundred years - and no one saw any reason to believe that this purchase was illegal or contrived in any way. As far as the Ottomans were concerned the stones had little historical or cultural value and the Ottoman Greeks of the day, had no real voice or choice in the matter. So, why has this event caused so much furor over the last fifty or so years and has it actually got anything to do with the stones themselves. Recently it has been announced that a famous society lawyer has been instructed by the Greek Government to assist in the repatriation of the said marbles, which she has agreed to do, on the back of her world renowned marriage to the Hollywood film star, Mr. George Cloony. Mrs. Amal Clooney, an attractive and charming woman – and a bright star in the normally gray sky of the legal profession - is now getting headlines and front page attention from even the conservative Huffington Post. What, you may well ask, is the reasoning behind this appointment, is this really about the ancient culture of Greece, or more so the horrifying condition of the Greek economy?A cynical journalist may well believe, that matters pertaining to Greek Culture – although of considerable importance to a small percentage of Greek citizens – might not be as important as repelling a broadside from Mrs. Angela Merkel and her cohorts at the IMF and in Brussels. For too long, the Greek media has been full of photographs of certain rather seedy looking individuals. Generally referred to as accountants - or bean counters - in their cringing desire to appease the wrath of the German Chancellor and other assorted Tuetonic players, they have lost the public admiration, and dare I say respect. However, seen chatting up some attractive, high class and famous Hollywood totty, will do their Public Relations a power of good - in the eyes of the gloomy Greek press - and I hope the financially depressed and forlorn Greek public. They at least deserve to have some color in their lives, despite the realities of successive spendthrift Greek governments, and their irresponsible leaders.